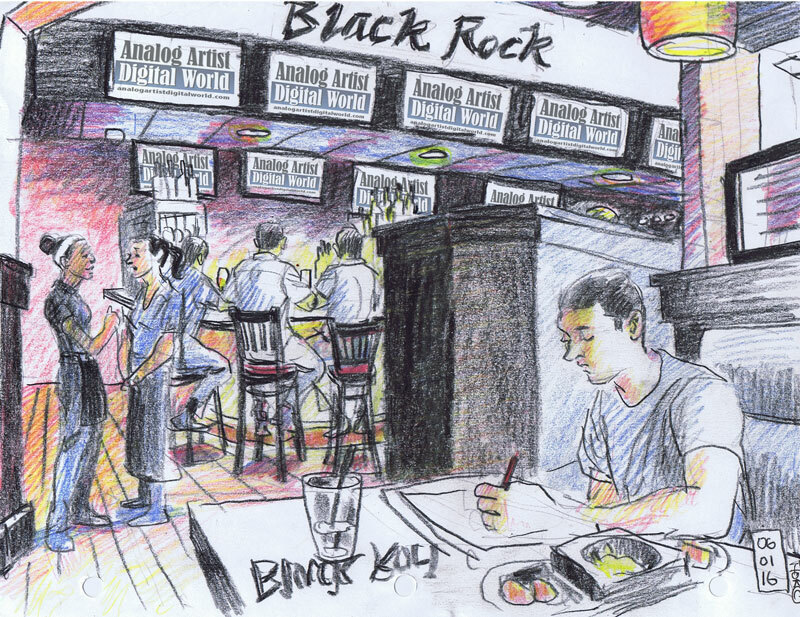 Analog Artist Digital World: Black Rock opens on Conroy Windermere Road. 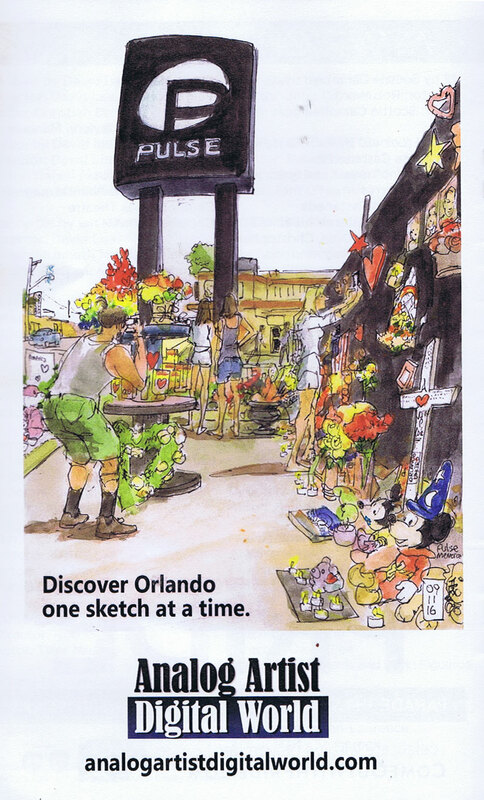 I teach an Urban Sketching Course at Elite Animation Academy (8933 Conroy Windermere Rd, Orlando, FL 32835). 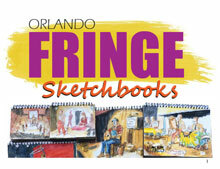 The main premise l to encourage students to keep a sketch pad with them at all times, so they can document the everyday moments of the lives. How often have you gone to a restaurant and found the wait time intolerable? 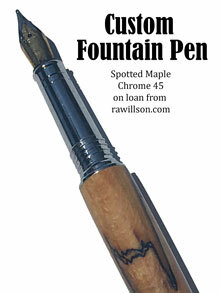 If you sketched then it would see like the service is always too good since you don't quite have enough time to finish the sketch you started. To a sketch artist sitting still, I work seems to us by. 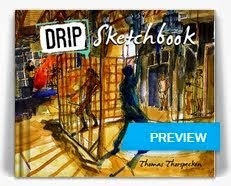 The challenge is to catch enough of those moments to bring the sketch alive. 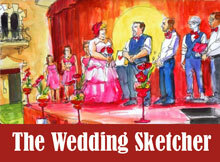 In this sketch, those two servers in aprons never actually stood and spoke to each other. Each was speaking to some one else who walked away before they could be captured. As the artist, I get to decide who interacts to each other in my world. Service was actually very good at Black Rock (8965 Conroy Windermere Rd, Orlando, FL 32819). The restaurant gets it's name from the sizzling steak it serves on literal hot rocks. I think the rock keep the steaks hot longer. I didn't order a steak. 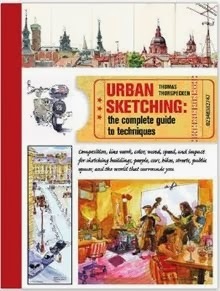 I was here with my three Urban Sketches to sample an appetizer and to sketch. This was the final class so we pulled out all the stops using co to as well as line. Watercolor doesn't hold up very well on | thin animation paper use in class, so I encouraged the student to try colored pencils to add color. I played along with them doing this sketch to show how I might approach the scene. The scene incorporate foreground, middle ground and background. We had guacamole which was also served in a black rock dish. I can say that the appetizer was quite good, and I hope to return someday to try a full meal. The food certainly smelled delicious as servers walked past with the sizzling meals.